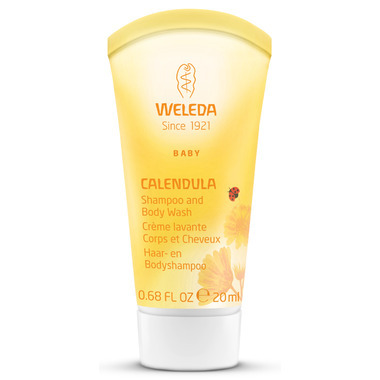 Weleda Calendula Shampoo and Body Wash Travel Size gently cleanses and cares for delicate hair and skin. Baby's delicate hair and skin gets the perfect balance of cleansing moisture and the kindest care in our softly lathering Calendula Shampoo and Body Wash. This all natural baby shampoo is a gentle wash that retains the moisture in your baby’s hair and skin, leaving them feeling silky smooth and protected from drying out. An all natural baby shampoo and body wash that cleans and softens without synthetic detergents. Formulated with the mildest organic and natural plant-based cleansers, Weleda Calendula Shampoo and Body Wash is gentle and tear-free. Biodynamic® and organic calendula flower extract in this all natural baby shampoo soothes and softens your baby’s hair and skin. Sweet almond oil absorbs fast and easily to keep your baby’s skin and hair from losing precious moisture. The gentle, effective formula of our Weleda Calendula Shampoo and Body Wash has a light and delicate fragrance that turns an ordinary bath time into a full-body pampering. Now that’s one clean, happy baby from head to shoulders, knees and toes (knees and toes). Amazing on baby skin so grabbed a small tube for weekends away from home. I'm a huge fan of the baby Weleda products. When I got this travel sized one I was a little surprised about the size but it ended up being the perfect amount for a trip of two weeks. Started using this on my son who has sensitive skin and eczema, its lovely smelling and his skin had no reaction to it and his skin is really soft. Love the fresh calendula smell!